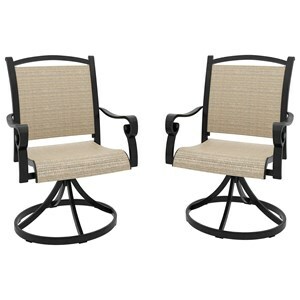 Built to last, this set of two swivel barstools is ideal for any and all outdoor activities. The sling fabric along the seat and back is comfortable to the touch and quick drying, perfect for after a dip in the pool or rainy weather. 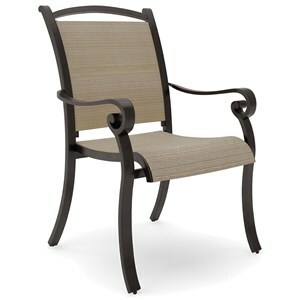 The rust-proof aluminum frame is made to withstand all of the elements as well. The Bass Lake Set of 2 Swivel Sling Barstools by Signature Design by Ashley at VanDrie Home Furnishings in the Cadillac, Traverse City, Big Rapids, Houghton Lake and Northern Michigan area. Product availability may vary. Contact us for the most current availability on this product. The Bass Lake collection is a great option if you are looking for Transitional Outdoor Furniture in the Cadillac, Traverse City, Big Rapids, Houghton Lake and Northern Michigan area. Browse other items in the Bass Lake collection from VanDrie Home Furnishings in the Cadillac, Traverse City, Big Rapids, Houghton Lake and Northern Michigan area.